If you have ever wanted to start turning pens, then this is the ideal kit for you! The Pen Starter Kit has all the pen parts to create two beautiful Classic European style pens that anyone is sure to love. All you need to do is decide what type of pen blank to use (pen blanks sold separately). 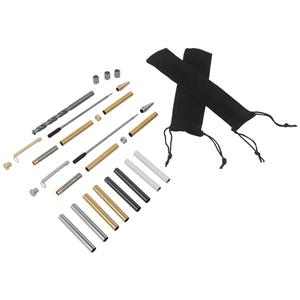 This kit comes with two felt pouches, bushings, a drill bit and two complete pen kits – one kit is gold finish and the other kit is a chrome finish. Plus we have included four replacement tubes (bright nickel, painted white, black nickel and brass) for a closer color match to your pen blank choice. When you’re finished making your pens, the included organizer tray gives you the ideal storage solution for pen parts, bushings or any other small items you want to organize and store. If you have ever wanted to start turning pens, then this is the ideal kit for you! The Pen Starter Kit has all the pen parts to create two beautiful Classic Cigar style pens that anyone is sure to love. All you need to do is decide what type of pen blank to use (pen blanks sold separately). 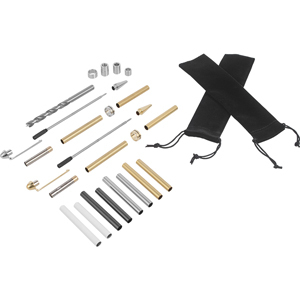 This kit comes with two felt pouches, bushings, a drill bit and two complete pen kits – one kit is gold finish and the other kit is a chrome finish. Plus we have included four replacement tubes (bright nickel, painted white, black nickel and brass) for a closer color match to your pen blank choice. When you’re finished making your pens, the included organizer tray gives you the ideal storage solution for pen parts, bushings or any other small items you want to organize and store. If you have ever wanted to start turning pens, then this is the ideal kit for you! The Pen Starter Kit has all the pen parts to create two beautiful Classic Slim Style pens that anyone is sure to love. All you need to do is decide what type of pen blank to use (pen blanks sold separately). 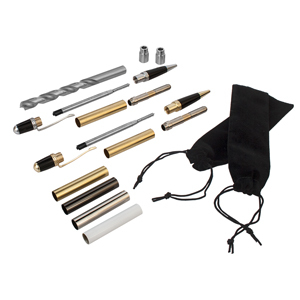 This kit comes with two felt pouches, bushings, a drill bit and two complete pen kits – one kit is gold finish and the other kit is a chrome finish. Plus we have included four replacement tubes (bright nickel, painted white, black nickel and brass) for a closer color match to your pen blank choice. When you’re finished making your pens, the included organizer tray gives you the ideal storage solution for pen parts, bushings or any other small items you want to organize and store. If you have ever wanted to start turning pens, then this is the ideal kit for you! The Pen Starter Kit has all the pen parts to create two beautiful Classic Wall Street style pens that anyone is sure to love. All you need to do is decide what type of pen blank to use (pen blanks sold separately). 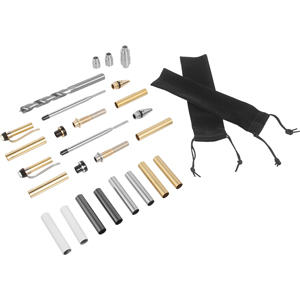 This kit comes with two felt pouches, bushings, a drill bit and two complete pen kits – one kit is gold finish and the other kit is a chrome finish. Plus we have included four replacement tubes (bright nickel, painted white, black nickel and brass) for a closer color match to your pen blank choice. When you’re finished making your pens, the included organizer tray gives you the ideal storage solution for pen parts, bushings or any other small items you want to organize and store.